Last year I saw some blogs all posting baked kale chips and I was intrigued. It's been on my list of things to make since then. But kale is not exactly one of the usual things on my grocery list and I don't purposely go out to buy. Luckily for me, my CSA from Hampstead Farms had kale in it this week (including a slew of vegetables I don't usually eat). So when I was presented with this opportunity, I dug up those recipes and whipped up some yummy, crisp kale chips! 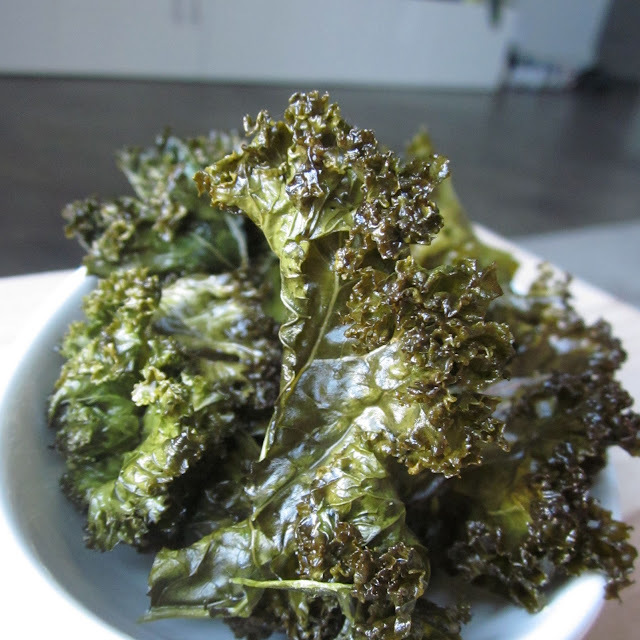 Rinse and dry the kale, then remove the stems and tough center ribs. Cut into large pieces, toss with olive oil in a bowl then sprinkle with salt. Arrange leaves in a single layer on a large baking sheet. Bake for 20 minutes, or until crisp. Place baking sheet on a rack to cool.